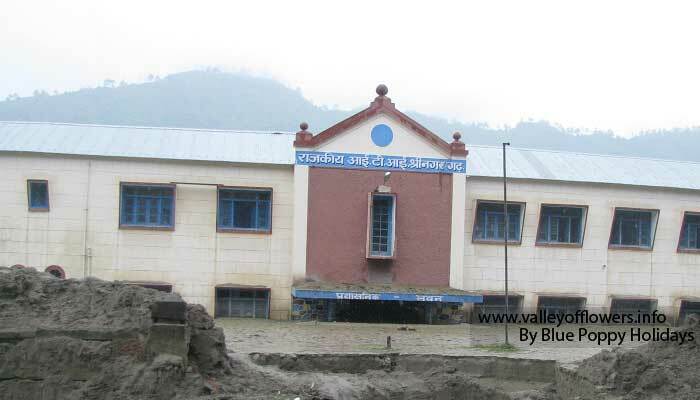 After floods and disaster in Uttrakhand in June 2013 this was my first trip to Uttrakhand. 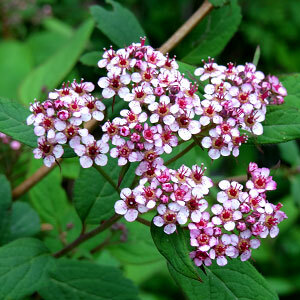 All of our tours to Valley of Flowers got cancelled. 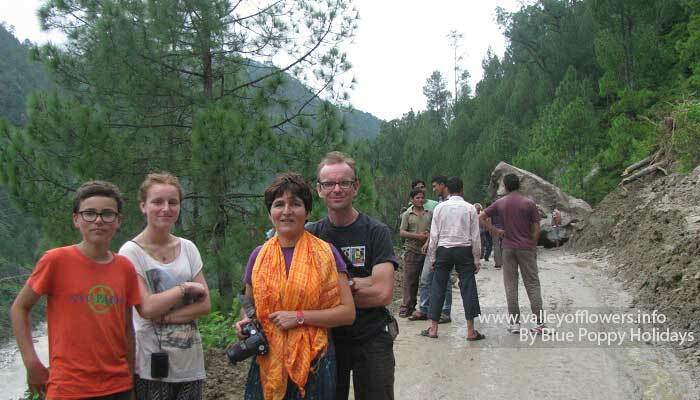 A family of four from Paris showed interest in going for a trek to Chopta, Tungnath and Deoria Tal. We were to start on 4th August but since 5th August was Shivratri and Haridwar was too much crowded. Moreover the National Highway – 58 was closed between Delhi and Haridwar due to Kawarias. Kawarias are people who take water from Ganges at Haridwar and bring it to their native places by foot. They occupy full National Highway for about a week. We postponed our trip from 4th August to 6th August. We started at 6.00 am on August 6, 2013 from Haridwar. Today our aim was to reach village Sari by evening. 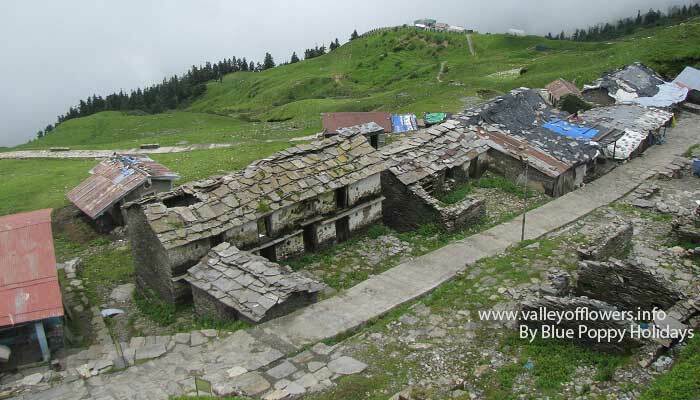 Sari is the base point for trek to Deoria Tal. By 11.30 am we reached Srinagar. We saw some evidence of the flood. There were houses full of mud. You can see in following pictures. Hanging bridge on Ganges, between Rishikesh and Devprayag. Government Industrial Training Institute building at Srinagar. First floor is almost full of mud. We encountered with a land slide at 2.00 pm but it was soon cleared. Traffic Jam due to Landslide. We were lucky that it got cleared soon. In the evening we reached at Nandprayag where a massive boulder blocked the road and it was declared by BRO (Border Road Organization) Officials that the road will be cleared by tomorrow only as a blast is needed to clear the road. 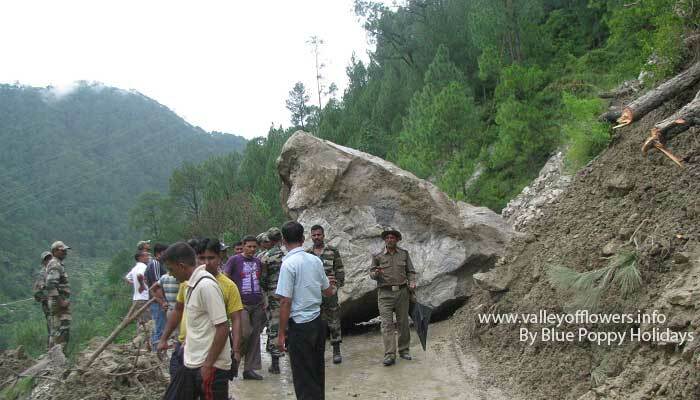 Huge boulder blocking the road near Nandprayag. Our group members at the land slide site at Nandprayag. Nandprayag is the confluence of Alaknanda and Nandakani. We decided to stay at Nandprayag and in the evening we went up to the confluence. Me and my wife at Nandprayag. At around 9.00 pm we heard a huge sound of blast and the road was clear. Next day we started at 7.00 am after breakfast from Nandprayag. From Chamoli a road separates to Ukhimath. 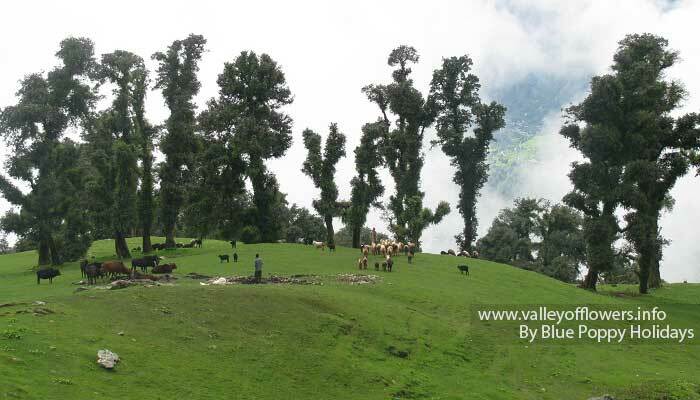 Village Sari and Chopta are on the way. 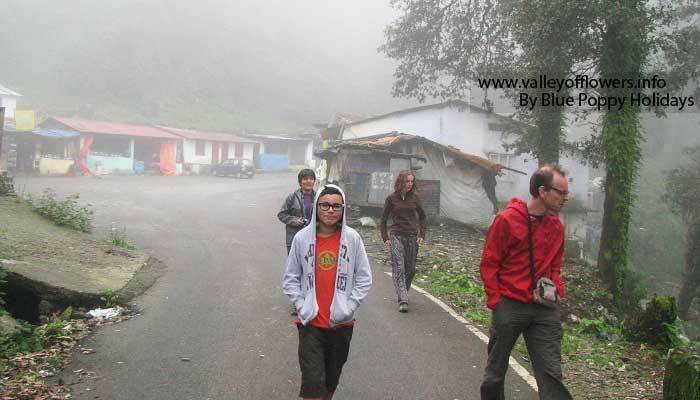 This road is generally used by pilgrims for going from Badrinath to Kedarnath. After the disaster we did not see a single tourist apart from our group during our whole trip. We had tea at a small teashop somewhere 15 kilometers from Chamoli. After taking tea we again started our journey to Sari village. Following are some of the pictures taken on the way. Our group having tea on the way to Chopta. A small halt near a beautiful river on the way to Chopta. A beautiful waterfall on the way to Chopta. 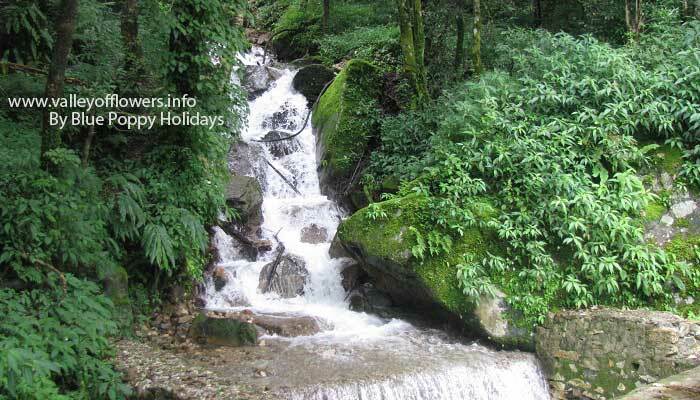 You will see many such waterfalls in last 20 kilometers before Chopta. Our group at Chopta. There is no other tourist in the area. By 3.00 pm we reached village Sari and had lunch in local house. After lunch we started our trek to Deoria Tal. Our group having lunch at Sari village. Mrs. Jerome and her children playing with a very lovely dog named Jimmy. This dog also accompanied us to Deoria Tal. It was our guard for the whole night and he scared away foxes. 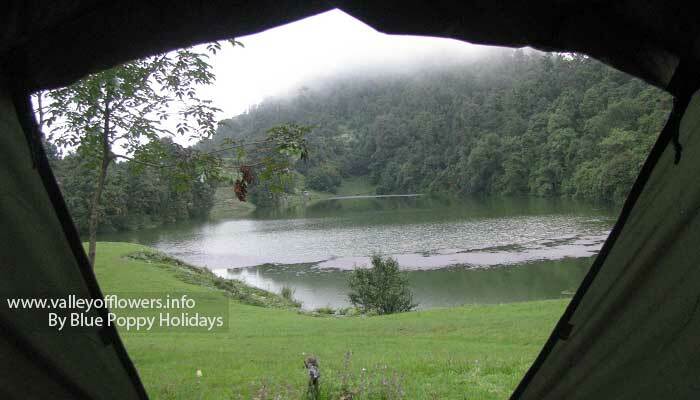 We reached Deoria Tal in the evening and erected our tents near the lake (Tal). Soon our dinner was ready and after dinner we straight way went to sleep. Next day we went for local trekking in the nearby forest. We saw some foxes near our tents. My camp at Deoria Tal. Our camps at Deoria Tal. A beautiful view of Deoria Tal. Beautiful view of Deoria Tal from my camp. I shifted my camps location to have a beautiful view right from my sleeping mattress. Group member having lunch at Deoria Tal. 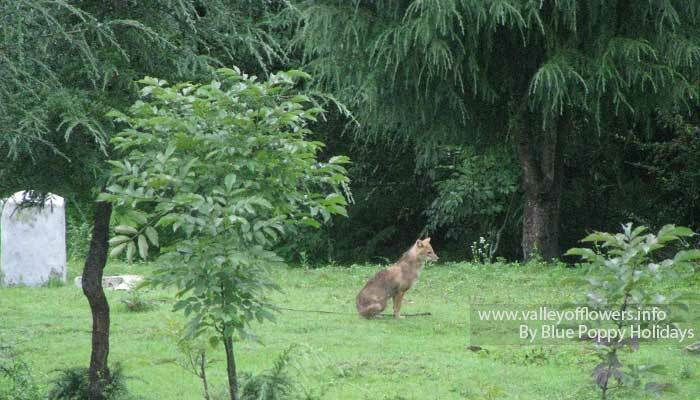 A fox near our tents at Deoria Tal. Next day we started for Chopta. 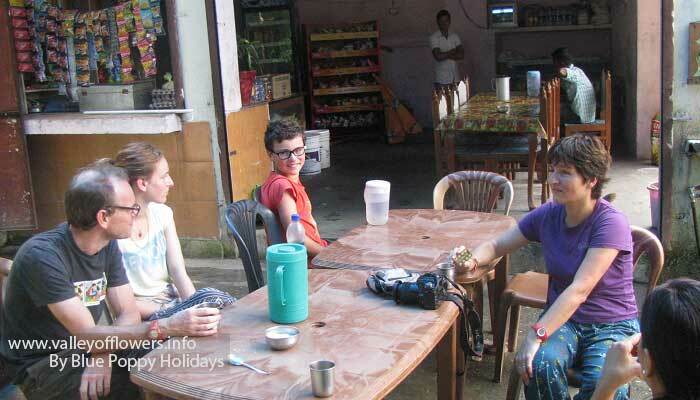 We had breakfast at Deoria Tal and lunch in home at village Sari. At Chopta we stayed in swiss tents it was very beautiful location. 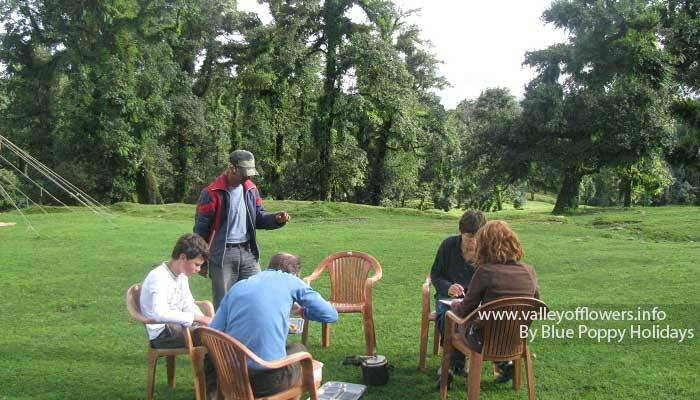 Groups members having breakfast near Swiss Tents at Chopta. 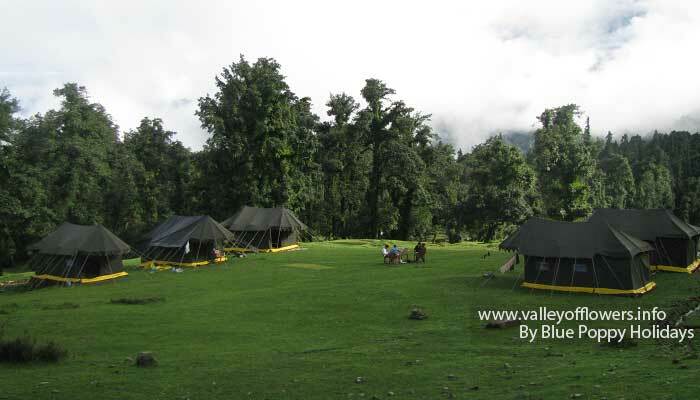 View of our tents near Chopta. 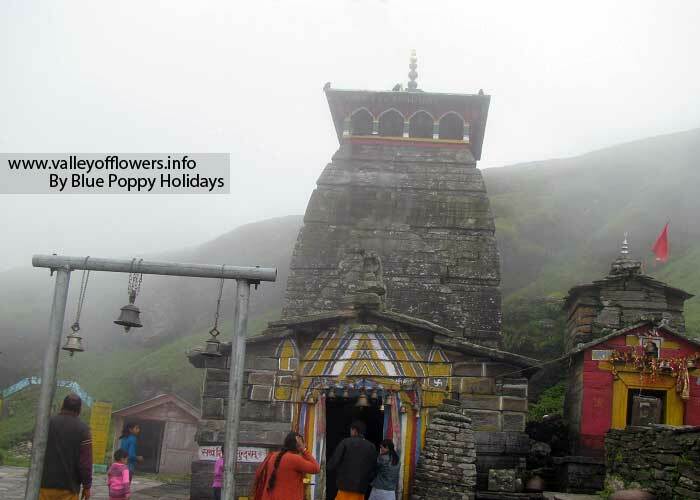 Next day after breakfast we started Tungnath Temple. The trek to Tungnath starts from Chopta it is a very beautiful trek following are some of the pictures taken on the way. 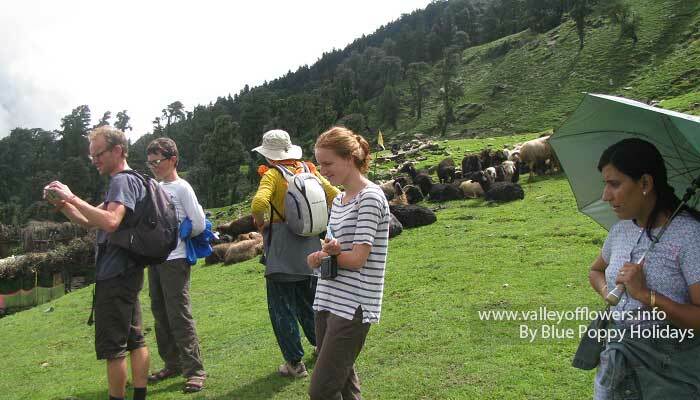 Group members at a Bugyal (Alpine meadows) on Chopta to Tungnath trek. A beautiful view on our trek to Tungnath Temple. A beautiful Bugyal (Alpine meadows) on our trek to Tungnath Temple. We can also camp here. 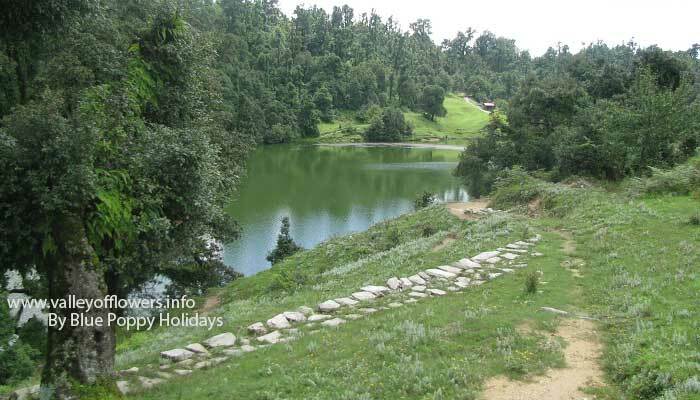 The trek between Chopta and Tungnath Temple. By 3.00 pm we came back to Chopta and after lunch we started our journey backward by road. We had night halt in a hotel somewhere 15 kilometers before Chamoli. Next day early morning we started and reached Haridwar by evening. 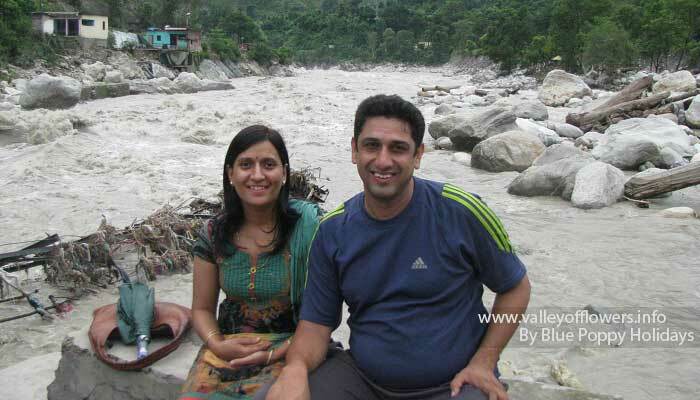 After the June disaster this was my first visit to Uttrakhand. 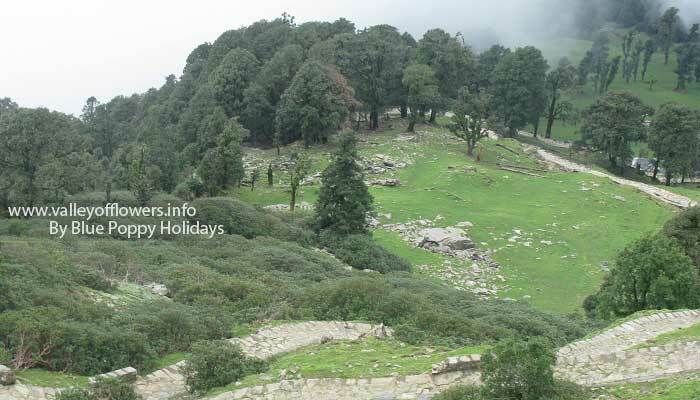 There were almost no tourists in Uttrakhand. Almost everyone is scared of going to Uttrakhand, but I did not find anything of which one should be scared of. Moreover, all of my trek members, myself and my wife all reach back safely without any harm. The disastrous event like this happen very rarely at I do not hope it to happen again in my life time. The Television Channels show only the negative part. I accept that the road in Kedarnath Valley is damaged badly but the road for Chopta, Valley of Flowers is OK. The natural beauty is intact at these places. In September I will be going to Kuari Pass If you are interested you can come with me. I will be posting another post soon as I have been to Ghangaria recently. 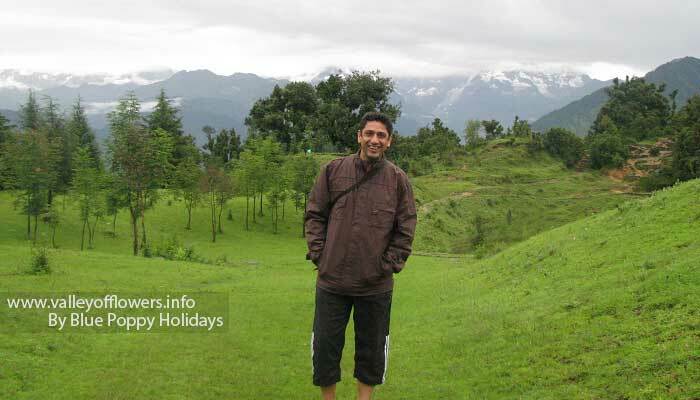 Thanks a lot for the rply sir.One more thing, can you tell me about camps in chopta for stay having reasonable rates. 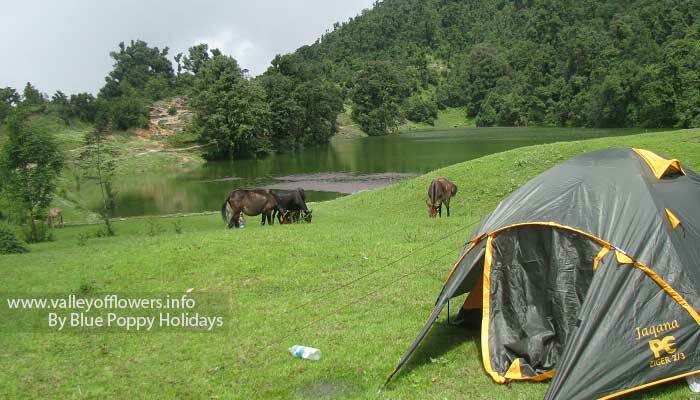 Camping is not required at Chopta you can come to Sari for night stay, you will need camping at Deoria Tal. 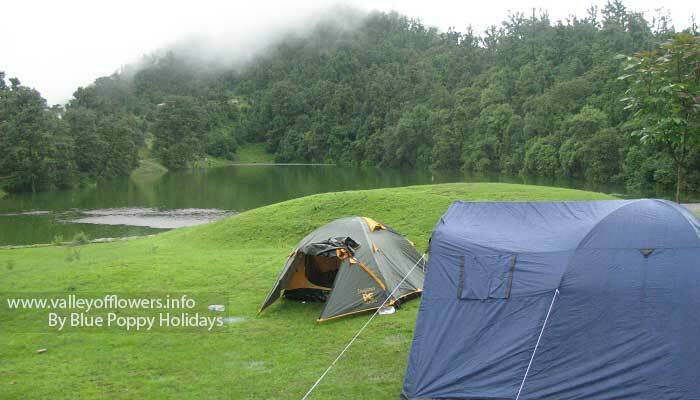 Camping rate would be Approx Rs. 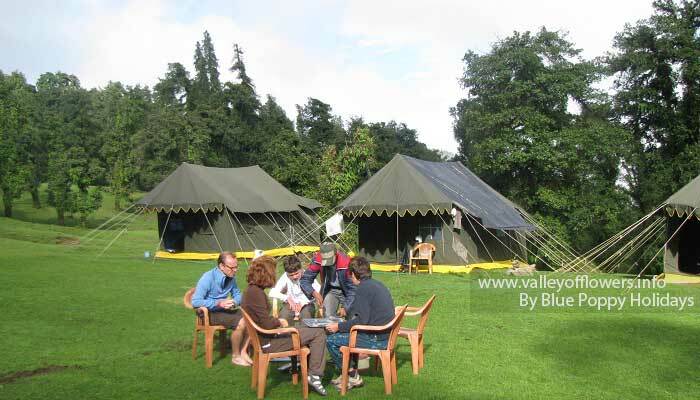 1500-2000 per person per night including meals and guide. I admire your commitment to provide such a wonderful service – you are on the mission and don’t look at it as your job! Your website is so wonderful and very thorough & professional – I will definitely like to do the trek with you- and looking forward to it either 2015 or 2016 July/Aug- sooner the better —cheers ! Your cooperation is anticipated and appreciated. P.S. – I would love to accopany your party on your subsequent trips. Maybe we can talk on Skype/G-Talk? 1. As far as budget is concerned it is totally dependent upon what services you take from me. We can talk over phone. My cell number is +91 9991142759. 2. You need not worry about foxes. They themselves are scared of human beings. 3. Road is open now even from Rudraprayag-Ukhimath. Otherwise we can go from Chamoli also. 4. I think you should have at least 4-5 days ex-Haridwar. Thanks Ashwani Ji. Nice to see your comment. Come with me to this wonderland. You will love it for sure. Hi Devkant jee, what a place to trek , India is full of amazing places, nice to see these pictures after natural………..and i had been to Sri Hemkund Saheb last year , on 25th July was on top at Darbar Saheb, amazing terrain , love to explore the treks. Thanks Ameet Singh. It was really a nice experience.